A moisturizing bar provides hydration to skin exposed to the cold, dry elements of winter. 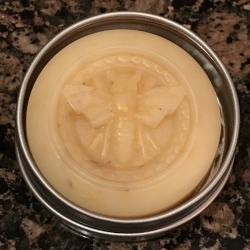 You might be more familiar with these being called lotion bars; however with the absence of water, I find that it doesn’t quite capture the true idea of the product. These bars are made with a basic recipe of: carrier oil(s), butter(s) and wax. You can choose what oils and butters you’d like for the results and/or benefits you want: a softer/harder bar, quicker/slower absorption, for sensitive skin, etc. Grape Seed Oil - Fast absorption, light oil, leaves skin silky, antioxidant, anti-inflammatory, moisturizing, scar reducing, skin balancing, restores collagen, good for normal, sensitive and oily skin types. Mango Butter - Quick absorption, soothing, gentle, good for sensitive skin, moisturizing, antioxidant, anti-inflammatory, healing, maintains skin’s elasticity and flexibility. Dried Calendula - Wonderfully healing for chapped, irritated and inflamed skin. What I love about these bars is that they don’t require a preservative, because of the absence of water, which makes them 100% natural! As long as there is no water or moisture exposure, they will last about a year. Now that you’re all done, store your creations in a tin, zip lock bag or any reusable container. These make a perfect gift any time of year and you can personalize them to an individual with additives like essential oils, fragrance oils, colorants or other botanical additives. The possibilities are endless! Until next time, discover the power of what you can create in your kitchen.